This week’s issue of Japanese magazine Jump has confirmed a May 19th release date for Namco Bandai’s Tales of the Abyss 3DS, which had previously been planned for release within Spring. 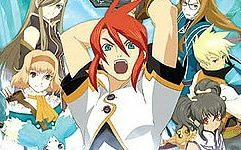 Tales of the Abyss was previously released on the PlayStation 2 back in 2005, and marked the eighth entry within the growingly popular Tales series. Set to be priced at ¥6,090, the magazine also details that a “Special Drama CD” will be included as a bonus item for purchasing. There is, as yet, no confirmation in regards to a western release for the title.